Keeping on top of boat admin can be a challenging feat. But with MyBoat, not only can you organise all of your boat documentation online, you can receive reminders when your boating equipment is due for a service, as well as alerts for insurance policy or moorings renewals. All you need to do is sign up to MyBoat... & what's more - it's free! Become a member of MyBoat by creating your free account. All you need to do is create a username and password and you’re ready to go. 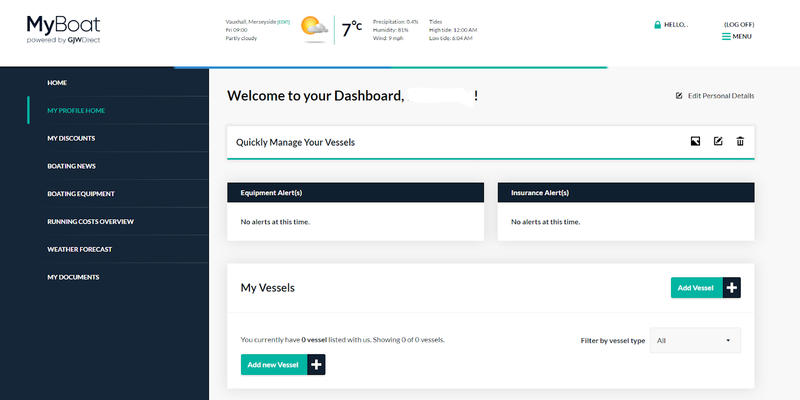 This is where you can quickly manage your vessels and view any equipment or insurance alerts. You’ll also be able to access your policy documents and see your running costs. Once you’ve set up your vessels in MyBoat, we will send you an email reminder with plenty of time to renew your insurance or get an item serviced. MyBoat manages all your boating paperwork and keeps it all safe in one place so you can stay on top of all your boating admin, wherever you are.